I have two A905X(S905X) units running the 8.95.7 release. I added MySQL to my Ubuntu Samba server so that I could have a synced media experience with both units. The server setup seemed to go fine. I created/edited the advancedsettings.xml per the Kodi wiki. The units came up with a blank library as expected. 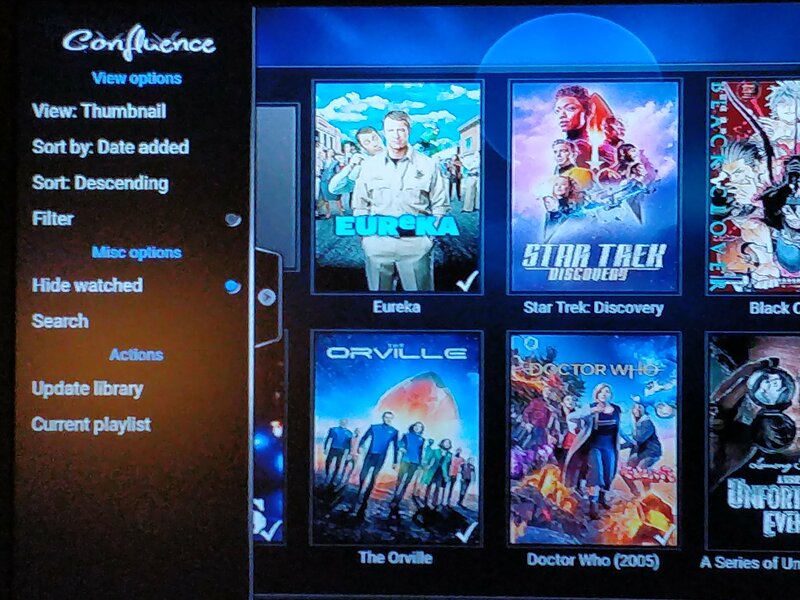 I added my samba share sources for my TV and Movies. The scan seemed to work fine. Paused videos showed the same pause point regardless of the playback device. I used the WatchedList add-on to restore the watched/unwatched state as I during other kodi migrations I have had in the past. All the movies seem to behave as expected. The TV shows on the other hand are misbehaving. On an initial boot when I go into the tv shows with Hide watched enabled. No shows marked watched are visible as expected. If I then select a show to view the eps or seasons, and return to the show listings I can see the shows marked as watched and unwatched. The check mark is shown on the watched shows. The Hide watched option is still enabled, but not working. If I return to the Movies, all behavior is as expected in the Movies. Tv Shows remains broken until I reboot. Here is a pic of what I am seeing on the TV. I have tried deleting the database from MySQL and recreating the whole thing in case it was corrupted somehow. The end results were the same. I also see this behavior when use Confluence or Estuary skin, so I do not think it is skin related. This is my first attempt at creating a MySQL database for Kodi, so I am guessing I have a permission wrong or something somewhere. However I have no idea where to start looking. Does anyone have a suggestion on how I might fix this strange behavior? Edit. I discovered that the movies are also misbehaving. After one movie is started all the watched movies appear in the list despite the Hide watched option being toggled on. Can you try the nightly and see if you still have this issue. I updated to 20190125 and am seeing the same behavior. Is there anything else you want me to try? I can try to get logs, if that is needed. I might need to be told where they are stored, but I am happy to check. So far it is working correctly now.